Before you buy any set of brushes, I suggest to start looking for a set with only the brushes you know you will end up using. Everyone’s makeup rituals are different; so let’s say you’re not into using eyeshadow, then you’re probably better off to buy separate brushes rather than a complete set. 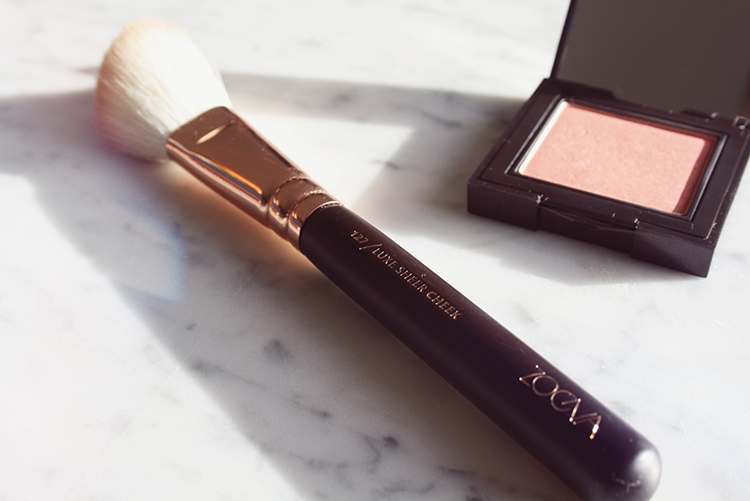 I’m very impressed by The ZOEVA Rose Golden Luxury Set, which is basically a collection of 8 essential handcrafted brushes, 5 for your face and 3 for your eyes. 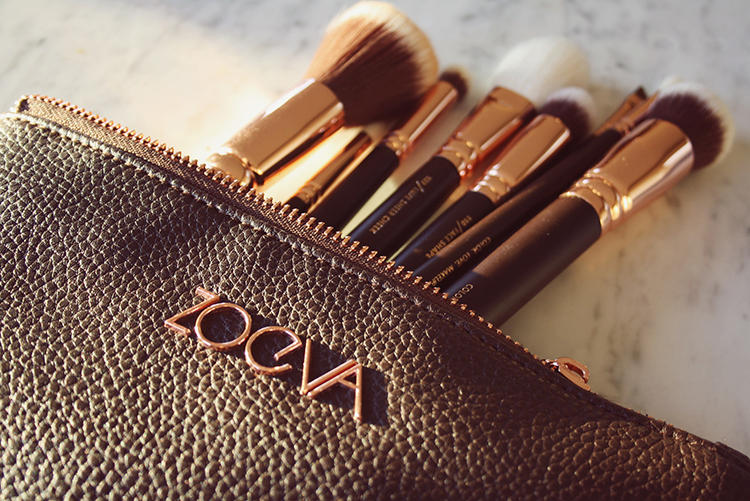 For me, this ZOEVA kit with 8 brushes is more than enough, it covers all my needs for daily use. It comes with both high quality natural hair and synthetic taklon bristles, depending on the kind of make-up that’s used with it. Because synthetic brushes do not absorb the makeup pigment as much as natural-haired brushes do, they are most suitable for applying liquid or creamy makeup products while giving you an even coverage. 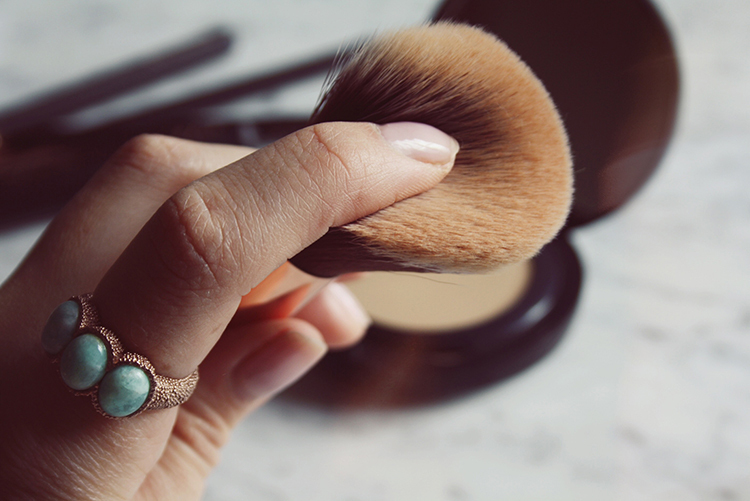 On the other hand, natural-hair bristles are perfect to apply powdery makeup products. 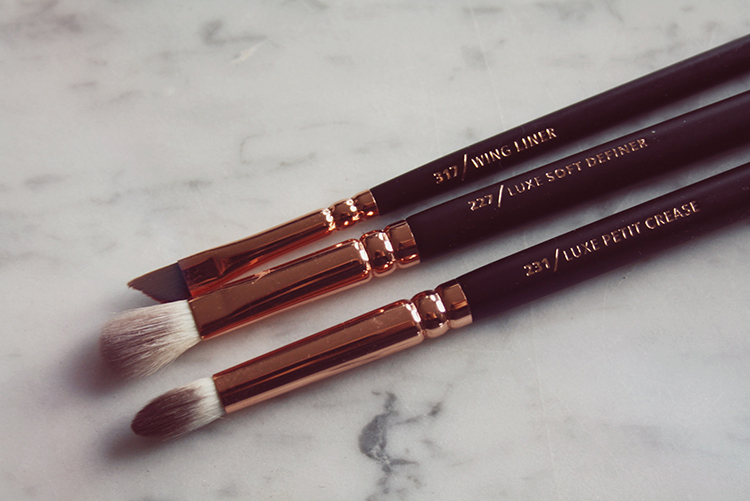 This brushset is difficult to resist, if only because of the beautiful Rose Golden ferrule details. They really stand out against my other silver ferrule brushes with black handles. But there’s more! The brushes come stored in a pretty brown leather pouch (not real leather, but a good quality faux leather) detailed with a beautiful rose gold zipper. The pouch is 24 x 18 cm (about 9 by 7 inches), which makes it very convenient to bring with you. Besides that the brushes not only come in a handy pouch, they are also protected with extremely useful plastic sleeves that help preserve your brushes. To apply my foundation I switch between this dense but soft feeling 102 foundation brush and my Beautyblender. Just like the Beautyblender this brush distributes the product evenly on my skin, without leaving any brush marks. But this obviously also comes down to the right application technique. 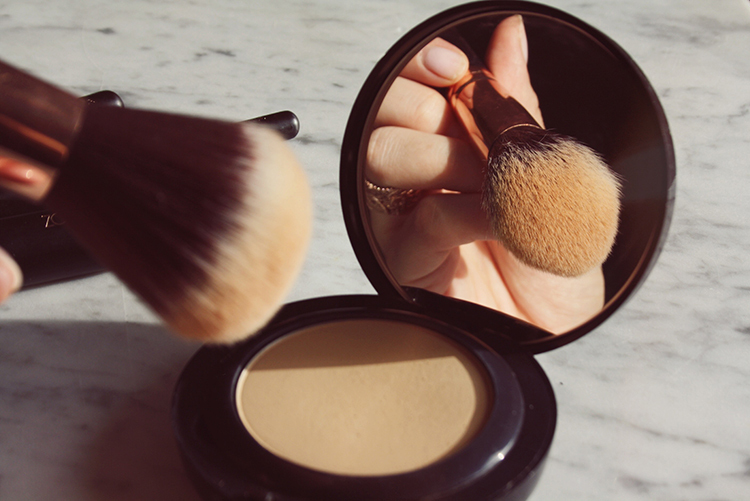 I get the best results by blending the foundation in circular motions into my skin. 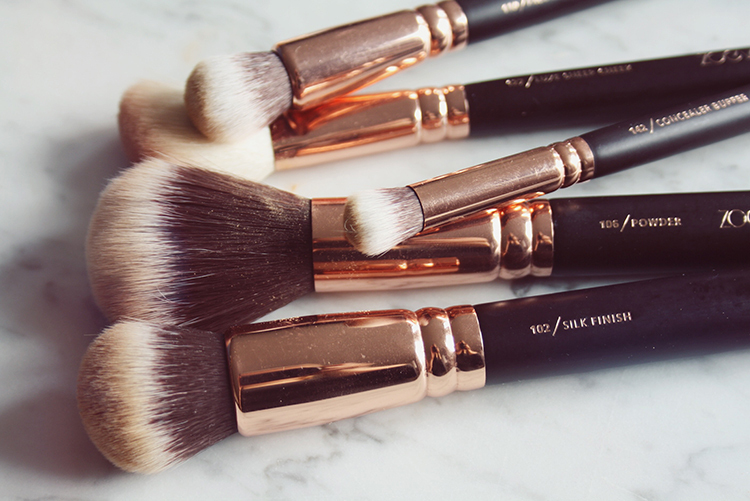 The 110 face shape brush is exactly the same, it’s just a smaller version of the 102 Silk Finish brush. 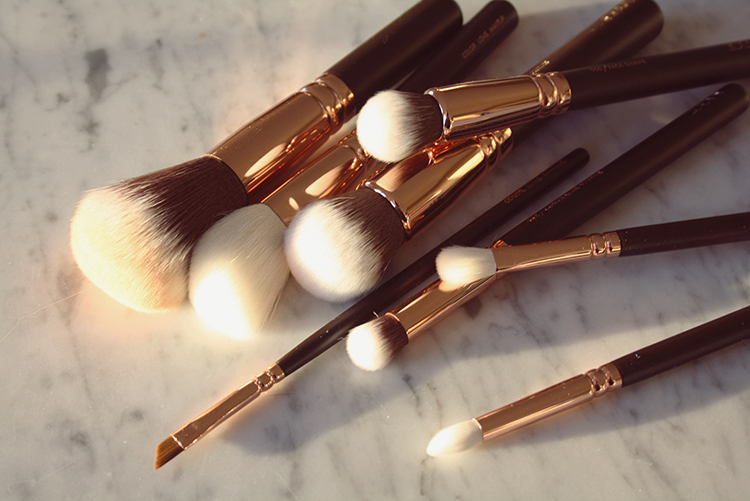 This brush is an extremely useful tool for contouring the face with cream and powder products. Just like it’s big sister brush the 102, this 110 brush has the hairs packed tightly together, which makes it easy to buff the product well into the skin. I also prefer to use this brush for my thick under-eye-concealer, which asks for such a strong, dense brush to make sure the product is well-buffed into my skin. This 144 concealer brush is an even tinier version of the 106 which allows it to work very precise, making it the perfect brush to apply concealer onto blemishes. The super soft 106 powder brush is perfect for picking up any loose and pressed powders for a concentrated application with an evenly powdered finish that doesn’t look too cakey. 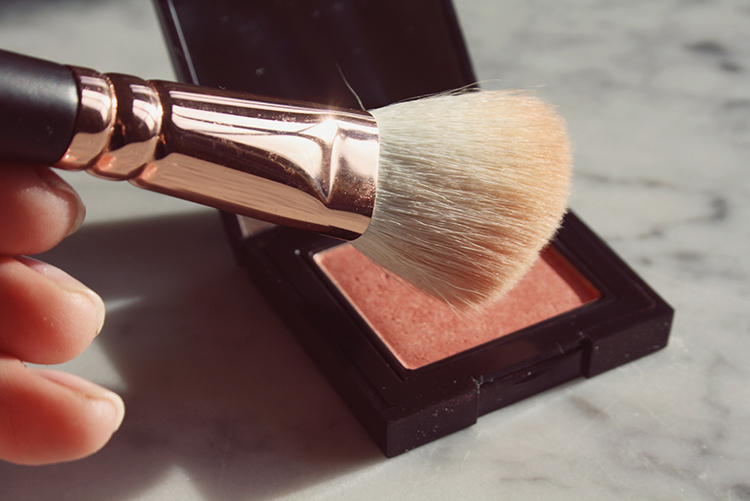 I love, love, love the 127 Luxe sheer cheek brush, which is amazing at applying my powder blushes. I find blusher one of the hardest makeup products to apply, because when applied wrong it can completely ruin your overall look. But this white angled brush definitely does the job for me! When using it I just simply tap my brush into the blusher (avoid overloading the brush) and gently dab it onto the apples of my cheeks! It’s a bit of a fluffy brush, not too dense, which works beautifully to blend in the pigments and gives you a very natural, effortless finish. 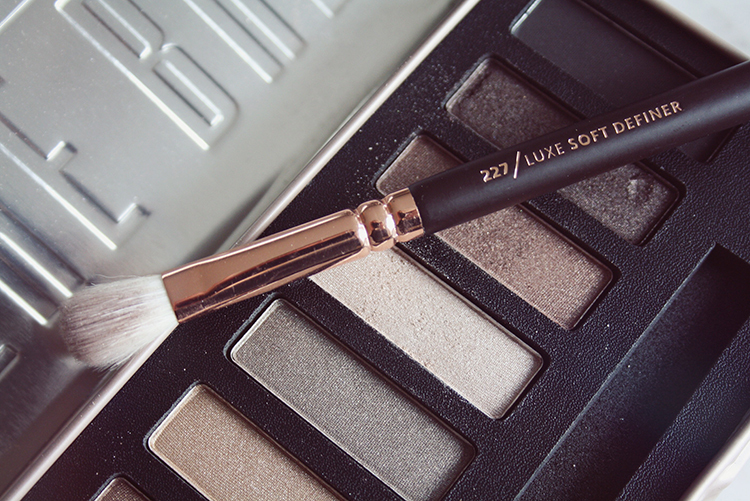 The 227 Soft definer brush is a fluffy and soft blending brush which I use for the application of eyeshadow over the whole eyelid. It’s great for picking up both pressed powder and loose pigment eye shadows. 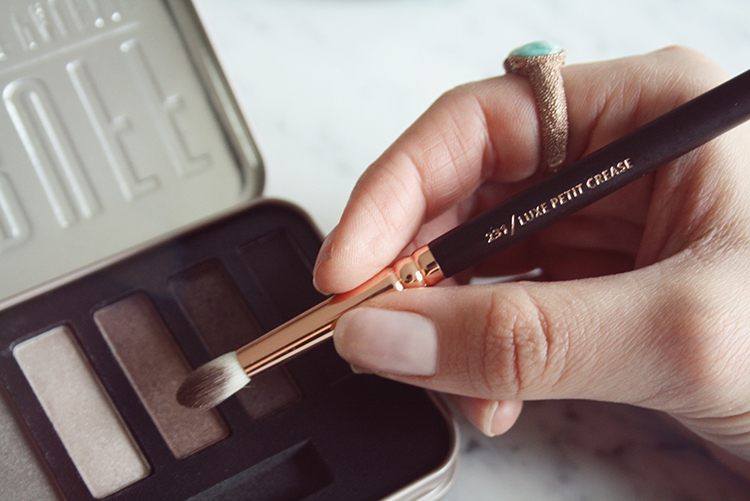 The shape of the 231 Petit crease brush is tapered, which makes it easy to precisely apply and blend eyeshadow, even in the crease of the eyelid. You can create a pretty smouldering eye effect. 317 Wing Liner – Synthetic bristles (Nylon). 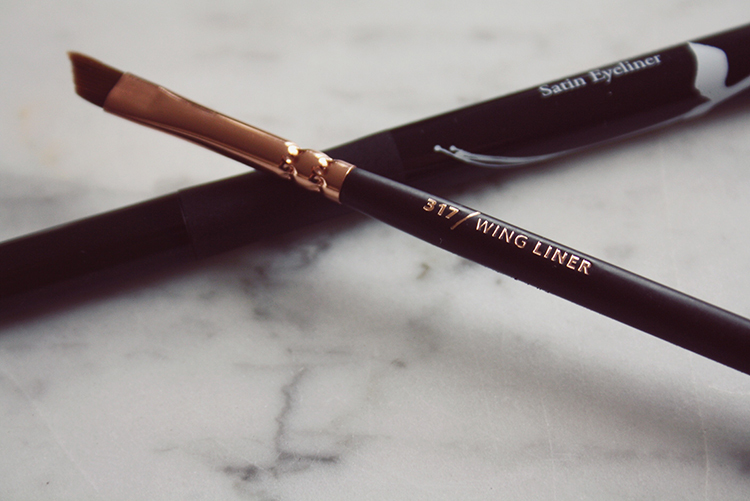 The angled 317 Wing liner brush is especially great for applying creamy eyeliner, it lets you create detailed eyeliner strokes and the perfect wing. But I usually go for a liquid eyeliner pencil. And when I want to create a smokey eye I find this brush extremely useful to soften the lines of my eyeliner and blend it all-in. Zoeva is a German based beauty brand with products almost exclusively available at stores in Germany, but luckily you can now order them online. And in case you are wondering, the whole set of 8 brushes only cost €65. Which I find more than okay when you count that it’s less then €8 each and even then the lovely pouch is a great bonus! Posted in BeautyTagged Brushes, Laura Mercier, Tarte cosmetics, The ZOEVA Rose Golden Luxury Set, ZoevaBookmark the permalink. Love this! Ive been searching for some new brushes lately and this is super helpful! Can I ask what brand the eyeshadow displayed is? 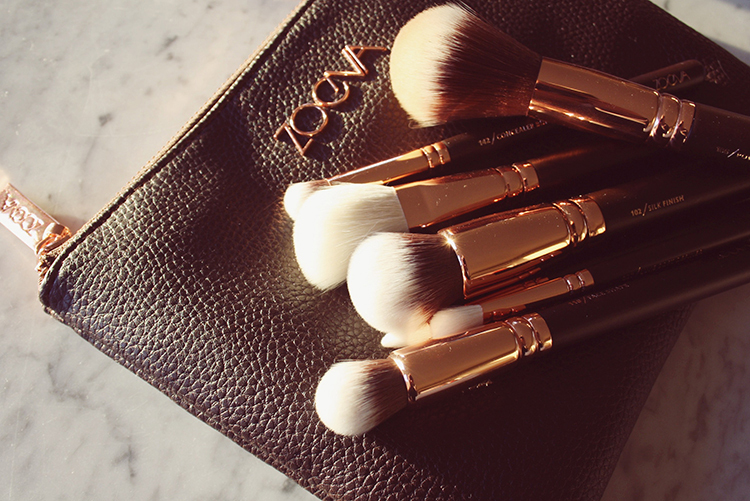 So in love with the Zoeva brushes! !